Are you wondering how much money you might spend per day on a beach holiday in Thailand? 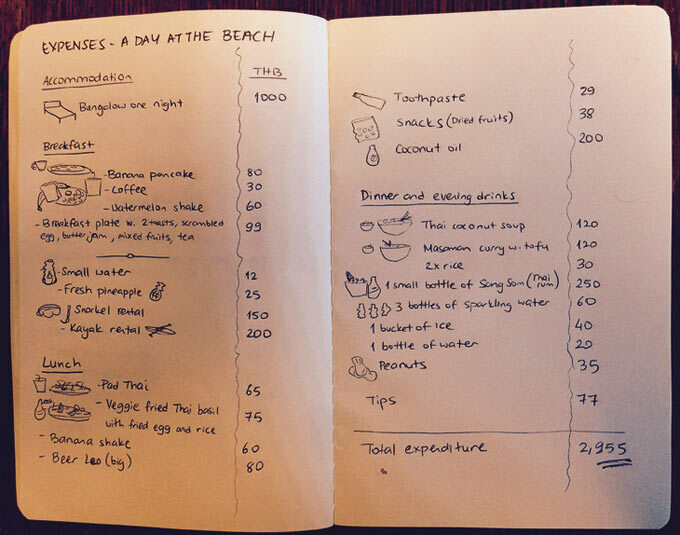 We decided to plot down our beach expenses during a normal 24 hours of beaching in Thailand. We stayed in a comfortable but by no means luxurious hillside bungalow resort at Koh Phangan’s Thong Nai Pan Beach (หาดท้องนายปาน). The beach is in the north-eastern corner of Koh Phangan, but the same prices can easily be found in most of Thailand’s other beach destinations. So our beach expenses during 24 hours ended at 2,955 Bath. Divide this by 2 persons, and the daily cost at the beach is just under 1,500 Bath per person per day (approx. USD 45). We certainly did not suffer, and we did not particularly attempt to save money. Bear in mind that daily beach expenses could cost far less, if your budget is tight and you are willing to cut down on comfort. A simple bungalow or a private room in a budget guesthouse can costs you as little as 250 Bath per room – even a few steps from the beach. If you opt for the local street food, your meal can easily cost 50-60 Bath. Needless to say, your 24 hours at the beach can end up costing you a lot more if you take the luxury road. In the above example, we stayed at Thongtapan Resort. It’s perhaps the last resort on Thong Nai Pan beach to retain the original beach bungalow feel. The bungalows are mostly made from natural materials, they are clean and spacious with private bathrooms, and they even have air-condition, should you want to cool down. There is no pool. Who needs a pool with the pleasant and inviting sea a few steps away, anyway? We hope our list of expenses have given you a rough idea about the beach expenses you can expect while traveling in Thailand. In our humble opinion, there are very few places that can compete with the value for money you get here. Obviously, the tourist numbers in Thailand indicate that we are not alone in this assessment. Next postTourism Leakage – this is how little your money contributes locally! Thailand certainly has changed quite a bit over the decades. A lot of pool villa resorts have replaced those simple backpacker bungalows. But there is still plenty of options for budget travelers, and the value for money is still hard to beat. As argued earlier, you might just need to get slightly off the beaten track. Good article. This seems to reflect my own findings but on the mainland and in Bangkok. 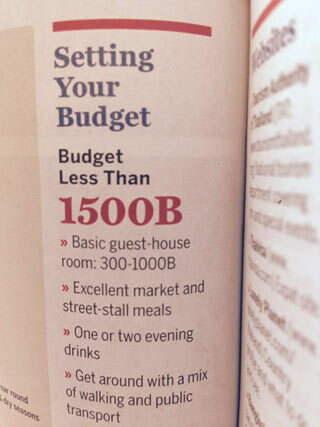 I budget myself just 1250Bht a day (£25 GBP) including cheap accommodation at around 200 Bht (£4 GBP). I am sure I could do it for much less further North too. As always, it depends on your lifestyle choices. Thank you, Peter. Definitely, you could live cheaper, especially in Isaan (North-East Thailand) which never really caught on for tourists. But as you mention, it all depends on personal choices as Thailand pretty much covers the entire budget range. I spent five years in South East Asia and found living in Chiang Mai for 15000baht (£300) a month was easy. Even a condo in a complex that has a policy and gym would only push the budget to around 20000baht. Cambodia and Vietnam are much the same. If you like beaches on a budget that same 20000 a month will get you a nice apartment, food and drink a stones throw from the beach south of Bangkok – as long as you stick to the mainland. The islands, while superb, are expensive.